Investors look at each deck for an average of three minutes and 44 seconds. Make sure you get it right. Entrepreneurs know their company’s pitch deck is important. But it’s also one of those things they might put off. Maybe because they don’t have the graphic design expertise or the know-how to make it good. This is not a smart move. Pitch decks are pivotal in getting investment, and why have a great product if you can’t get it attention? Like the elevator pitch, the deck has to get the point across fast. According to a study by DocSend, investors look at each pitch deck for an average of three minutes and 44 seconds. And companies average 40 investor meetings over three months to close a funding round. Investors were most interested in slides about financials, the team, competition, and their “Why Now” argument, the study said. Every deck is different, but take some inspiration from the first pitch deck of these billion-dollar companies. 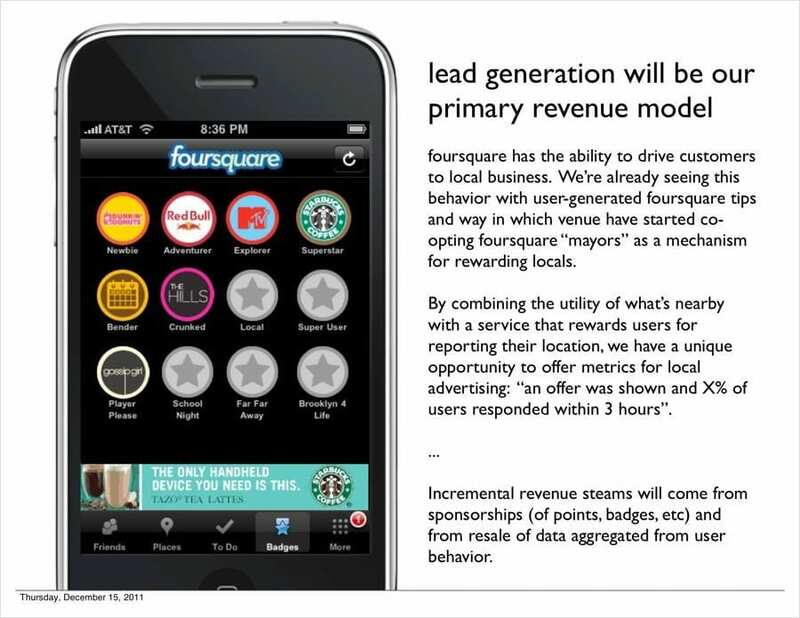 Here’s the first pitch deck Foursquare used in 2009. This deck does a great job using social proof that the app already has users. Notice how the company seems highly-focused by showcasing one primary revenue source. This deck adhered to the ideal length: less than a dozen slides not including the appendix. Plus, the graph shows growth projections in a way that’s visually friendly and easy to read. The “problem” slide Airbnb uses here is an efficient elevator-length pitch. It gets right to the point with three main bullets that clearly and convincingly explain why the product matters. The deck also has some simple graphics that pack a punch. And I’m not talking about the kind of graphics you need a designer for — anyone could do this. Here’s a slide from a pre-launch pitch deck that does a killer job breaking down the specific value Mint will provide its partners. 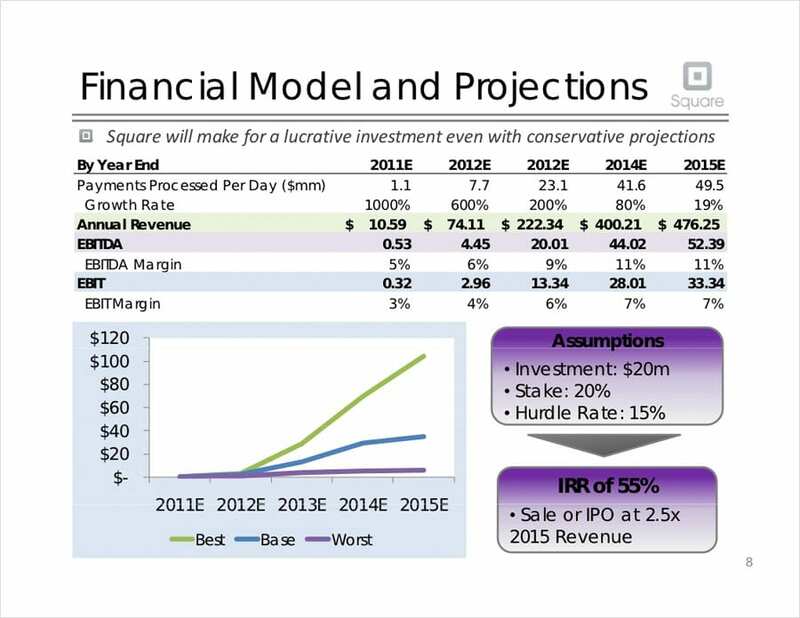 And this slide shows a number of exit strategy options that shows the company is looking ahead. One of the better visual pitch decks, Piccsy is aesthetically exciting and interactive. And at a modest six slides, it allows even the most the time-strapped investor to see what they need to know in a matter of minutes. If the pitch deck is stressing you, just take a deep breath and chill. The simpler, the better — it’s not about bells and whistles here. If you really believe in your product and know it inside out then you’re in great shape.